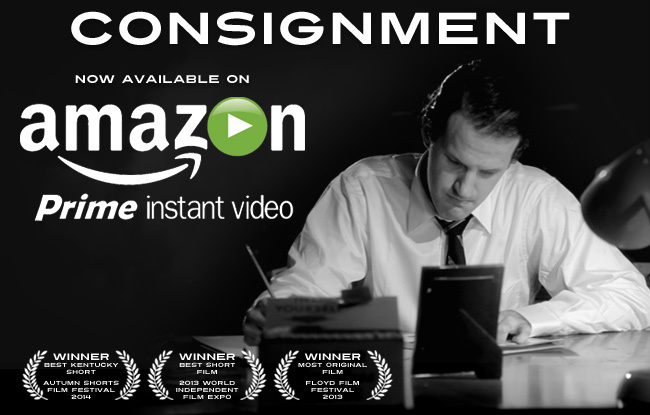 Justin Hannah's "Consignment" now streaming on AMAZON PRIME INSTANT VIDEO! David Lynch hasn't made a film since 2006's Inland Empire, but his body of work continues to fascinate new viewers while inspiring a generation of filmmakers. While we wait Lynch's next project, fans of the mysterious and surreal will find much to love in CONSIGNMENT, one of the new crop of films arriving on Amazon Instant Video this week. CONSIGNMENT, available to stream free for a limited time with an Amazon Prime membership, is a film noir mindbender that manages to capture the atmosphere and perplexing dream logic of Lynch's films (Lost Highway, Twin Peaks: Fire Walk With Me) while creating a unique world all its own. CONSIGNMENT is a stylish black and white mystery set in 1950's suburbia. In the film, a desperate young woman must choose between a life of loneliness and a curse of hollow love, while a consignment shop holds a dark secret. CONSIGNMENT has screened at numerous national film festivals, winning awards for Best Short Film, Most Original Film, and Best Kentucky Short. The movie (as of January 2015) holds an impressive rating of 8.8 on film site IMDb. The film has drawn comparisons to the work of both David Lynch and Alfred Hitchcock. Film critic Ruth Burgess praised CONSIGNMENT as "a beautiful and ornate puzzle, disguised as a film noir romance," comparing the film's hypnotic quality to that of Mulholland Drive, Donnie Darko, and Stanley Kubrick's The Shining. Mark Bell of Film Threat said that CONSIGNMENT "evokes a nostalgic mood while remaining puzzling." Richard Propes of The Independent Critic writes, "CONSIGNMENT seems to be the kind of film where with each subsequent viewing, you catch another piece, another sound, another image and another reality. It is not the kind of film that requires repeated viewings, but repeated viewings add to the film's complexity." CONSIGNMENT will appeal to fans of atmospheric mysteries, puzzles and noir thrillers. For a limited time, CONSIGNMENT can be streamed for free with an Amazon Prime Membership. After that time, it can still be rented or purchased through Amazon Instant Video starting at just $1.99. Amazon Prime has an estimated 40-50 million members worldwide. CONSIGNMENT is also available via Hulu and Hulu Plus, Vimeo On Demand, and IndieFlix.